Nose: A fine and balanced aroma. Over-ripened pears, honey and vanilla notes, a touch of cinnamon, stewed stone fruits, orange peels and plum come to the fore. No alcoholic tang despite the 47.1% volume. The later notes reveal themselves as toasted bread, grapes and chestnut. A complex set of aromas. Palate: Incredibly complex work of art. Notes of pear compote, honey bread, dried fruit, nutmeg, cinnamon and caramel. A chocolate and candied fruit taste. The finish is long lasting; pears, chestnut cask and spicy notes. Practically a Cognac, this is in fact an ‘eau-de-vie de vin’ aged slightly differently to a regular Cognac. 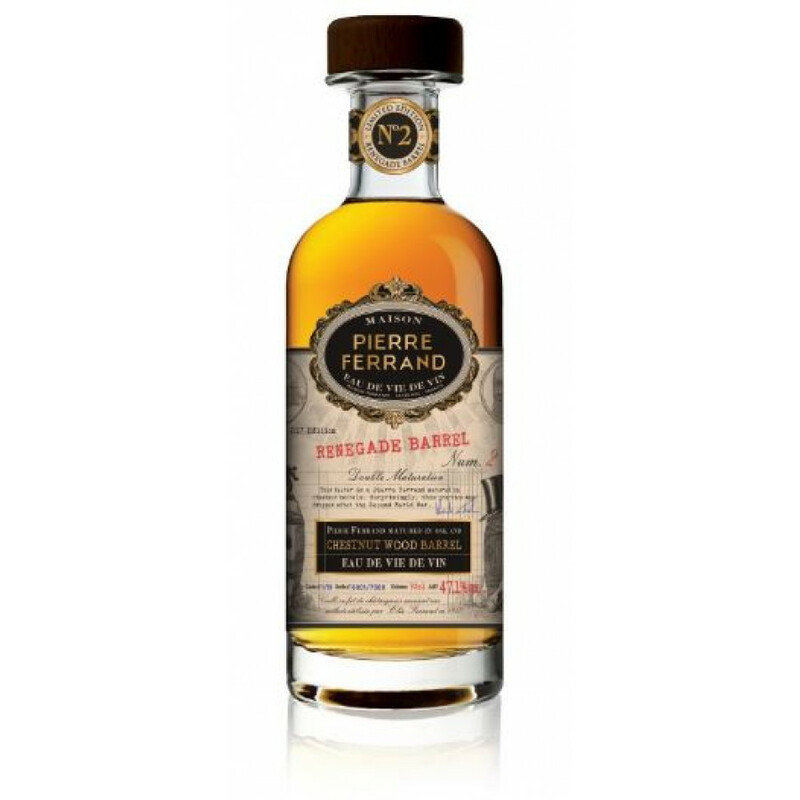 This family Cognac house continue to wow us with the Pierre Ferrand Renegade Barrel No2 Chestnut Eau-De-Vie de Vin which is firstly aged in French oak barrels, and then matured in a unique barrel made from wood of the chestnut tree - the result of breaking Cognac traditions and revolutionizing them. The result? A taste and aroma sensation that is incredibly fine - like no other you’ll have tasted. Since 1945 the practice of maturing Cognac in chestnut wood has been a long forgotten practice, and is no longer considered part of AOC regulation of Cognac - but Maison Ferrand showcase the reasons why it makes for wonderful eaux-de-vie with their rare Renegade Barrel No2. Created with Ugni Blanc variety grapes, it is a blend of eaux-de-vie between 5 and 7 years old. They are aged in oak, then used Cognac casks, with a small proportion of 25 year old Cognac is in there somewhere, too. It is finished for a year in a chestnut finish barrel, and finished to 47.1% ABV. The name comes from a daring nickname given to Alexandre Gabriel of Pierre Ferrand for pushing boundaries with this chestnut-matured Cognac. His experimentation led him to be called a ‘renegade’’. While Cognac production is largely wrapped up in tradition and generations of savoir-faire, Gabriel has proved that there is still much to be explored and discovered with the Renegade No 2. His plan is to release another every year. Pierre Ferrand pride themselves on experimenting with age-old techniques for Cognac production, and deliver every time. The precious nectar of the Ferrand Renegade 2 arrives in a classic small decanter, that is the perfect introduction to a beautiful spirit. This eau-de-vie was created in limited quantity. Naturally, this eau-de-vie should in part be enjoyed neat to experience all of what it has to offer. However, it should not be dismissed in a cocktail with high quality ingredients.